Hello friends, Linsey here today! Has Spring sprung where you live yet? I live in the Seattle, WA area and we are going through periods of sunshine mixed with bouts of rain, making way for all the signs of Spring, like the blooming flowers and beginning of new leaves on all the bare trees. I love this time of year and this card is just right for the feelings that Spring evokes. I normally don't do CAS (clean and simple) cards well. My style tends to be more of the "less is not more, more is more!" approach, hehe. However, this card came together quickly and easily by dry embossing the base and keeping with a simple white and pop of color combo. 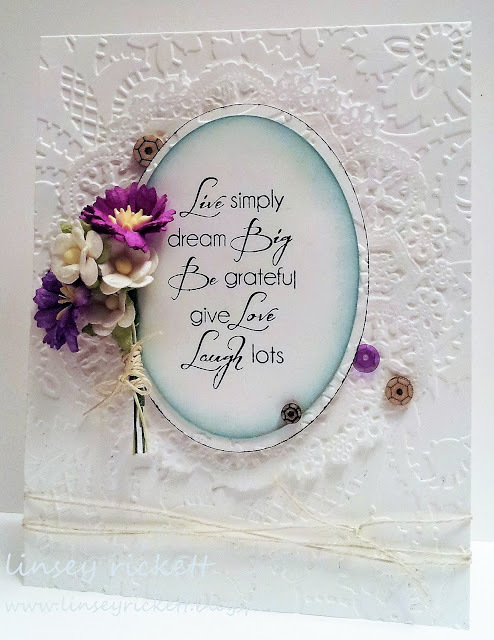 The sentiment and WOC Sweetheart Blossoms in Ivory and Cosmos Daisy Stem Flowers in Mixed Purple/White along with the ever-so-versatile Bamboo Cord Multi-Weight Set and a few sequins embellish this card to make it complete. I hope you like it and feel the warmth of Springtime in it! Thanks so much for stopping by today! Happy crafting! Linsey, this is really pretty!